Cyberunk 2020 Review | RPG Review Cooperative, Inc.
assault rifle in stilettos whilst running. Yeah, I'm sure it can be done; style over substance is the credo. There is two-column justified throughout with side-bars, which is just nice. Not so nice is the san-serif font. Often, all too often, the sidebars are mostly or entirely empty. Chapter headings on top-right, page numbers bottom-right, all good, but what is this large margin block "View from the Edge" and "All Things Dark and Cyberpunk"? The book is sixteen chapters plus "screamsheets", ranging from Netrunner (47 pages) to Drugs (2 pages). It's perhaps easier to consider these a collections of chapters for "Characters and System", "Combat", "Netrunning" and "Other Material". There is a fair one-page table of contents but no index. Mike Pondsmith's (et al) language is very informal, sometimes abrasive, and often very verbose. Again, it's style over substance and sure they've got the style right. There are a few typographical errors. There's plenty of attitude in this book. But y'know... I'm sure the 1st edition did just as well with less than half the page count. There are ten "roles" in Cyberpunk, equivalent to character classes and each has a special ability, usable only by that role. They are Rockerboy (Charismatic Leadership), Solo (Combat Sense), Netrunner (Interface), Techie (Jury Rig), Medtech (Medical Tech), Media (Credibility), Cop (Authority), Corporate (Resources), Fixer (Streetdeal), Nomad (Family). Each role has a fairly unnecessary page of purely descriptive text, except for the MedTech who receives a passing mention. Characters are built on points; either 9d10 (random), 1d10 for each of the 9 stats (random) or with values from 50 to 80 according to the Referee (cinematic). The stats are Intelligence, Reflexes, Cool, Technical Ability, Luck, Attractiveness, Movement Allowance, Empathy, and Body (Strength, Endurance and Constitution combined). Having a separate stat for Movement Allowance is a little different and I've developed a twitch when I see Technical Ability as an attribute. The Body stat is used to determine Save (roll under) against stunning attacks and mortality checks, and the Body Type Modifier is a reduction in the effects of damage due to physical brawn. A quick-character generation system is provided for "Fast and Dirty Expendables" before moving on the character's lifepath for those with a minimum of narrative permanence. A series of random (and some chosen) rolls determines dress and personal style, family origins, parental status, childhood environment, siblings, motivations, values, and life-events friends, enemies, romance, major events. Sometimes these will seemingly contradict the generated stats; e.g., a character who likes people but also rolled a low Empathy. My estimation is that this process will take an additional forty plus die rolls. Good idea, but very poor execution. The game system is skill plus stat plus 1d10 against target number. Given that stats typically range between 1 and 10, and skills also between 1 and 10, this means that the random element is 1/3 of the total score in most cases. This contrasts to most RPGs with similar resolution methods where the random element is equal to or significantly more than the skill and stat contribution, whether the system is roll high versus target number or roll low. A portion of a character's Luck may also be added to the roll with the total amount available per session. There is a small selection of sample action times and modifiers. A roll of 1 on the d10 results on a fumble with varied results according to the skill area, a roll of 10 gives a critical success and an additional 1d10. Characters begin with 40 points to distribute among 10 career skills, specified for each role. For example, a Nomad has Notice, Endurance, Melee, Rifle, Drive, Basic Tech, Wilderness Survival, Brawling and Athletics. Further, characters also get their REF + INT as points in other, non-career skills, as "pickup skills". Each skill receives around a paragraph of explanation. Where examples are provided of ability it is given in skill levels even though the game mechanic operates on target numbers, meaning that some of the descriptions can be significantly off-target if the character has an extreme related stat. Certain skills have a difficulty rating which represents a multiple for improvement; each skill "costs" the current skill level times ten in "Improvement Points", gained through study (about 1 per day), training (1-5 per day) and experience (awarded on the spot through use). Oddly the game recommends not to award more than 6 points per skill per session even though the awards chart for use goes up to 9. Characters can also acquire Reputation Points, to a single Reputation statistic but the application is frankly incomprehensible due to varying reputations from diverse actions. A standard 'outfit' is provided to all character roles, with the assumption of a basic, mobile, lifestyle. Special ability levels determine variable occupational monthly disposable incomes. All characters are assumed to have been employed for 1d6/3 (!) months. Weapons are the first major item on the equipment list with over almost forty possible firearms and heavy weapons, eleven melee weapons and fourteen types of armour are provided in their full statistical glory. This is supplemented with a few pages of more mundane "other" equipment with delightfully variable prices for housing, fashion, meals and groceries. Just under twenty-five pages is dedicated to cyberwear, "putting the cyber into the punk", as the chapter is entitled. Immediately we are introduced to the notion of cyberpsychosis, a loss of 1 EMP for every 10 Humanity Cost that cyberwear brings. Therapy can restore 2 HC per week, or 2 EMP per week if the cybernetics are removed. It must be noted that cyberpunk was the game that introduced this thematic system component and deserves serious kudos for this. Cyberwear covers cosmetic changes, neuralware, a variety of implants, a small selection of biowear, cyberweapons, and cyberoptics. In addition to these are various chipware, mental implants, providing instant skills according to the level of the chip. The physical based chips require time for the body to adjust to the program, at a rate of 1 day per level. The combat system in Cyberpunk 20.20 is significantly changed from first edition, and mainly for the better; characters acting three times as fast as others and dodging bullets at point blank range are two example improvements. Combat is carried out in rounds of 3 seconds each, with initiative based on 1d10+REF, +1/level for Solos), who are very fast. Snapshots are allowed with +3 initiative, but -3 to hit. A successful ambush (contest between Stealth and Awareness) give +5 to hit for one round. Target numbers for ranged attacks are based on distance and hit location is rolled when a successful shot hits; defenders do not get to dodge against ranged combat, their only protection being what is in the way, what armour they are wearing and a tough body type. If damage gets through to the last level they still take a point of damage regardless. For comparative purposes a light pistol does 1d6 damage, a medium 2d6 and a heavy 3d6. The amazingly common in actual play kevlar t-shirt stops 10 points of damage. A character's body score will stop 0 to 4 points of damage. Automatic weapons are capable of three-round-bursts at close and medium ranges, providing a +3 bonus to hit, with 1d6/2 hits actually scored. The bonus to hit plus the prospect of multiple hits makes this an excellent choice in most circumstances. The full auto rules are a little strange for every 10 rounds at close range add one to the attack total; however at medium, long and extreme range - to simulate recoil - subtract one for every 10 rounds fire. The number of actual hits is the attack score minus the hit number. Suppressive fire can be achieved by laying a number of rounds over an area in metres; an Athletics test is required for anyone entering the area (Athletics plus REF plus 1d10) with a target number of the number of rounds divided by the area. A failed test means that the character is hit by 1d6 rounds. Special and individual rules exit for "unusual" ranged weapons, such as laser, microwave beam weapons, taser etc. Most are sensible and easy to perform, with the exception of the microwave weapon special effects which requires particular cybernetics as a random rolls (e.g., cyberaudio shorts out). Area effect weapons include shotguns, grenades, gases, flamethrowers, miners, missiles and assorted explosives. Weirdly, the system got it 'right' when it described the effects of shotguns at close range compared to distance and then ignored this when managing the effects of explosives, where an all-or-nothing system is used for the blast radius. Melee combat is handled slightly differently to ranged combat. In this case, a contested roll is made between attacker and defender. There is a number of bonuses which particular martial arts styles can provide in such actions (e.g., kick, disarm, hold, escape etc). Dodging and parrying, announced at the start of the turn, impose penalties for other actions. Damage modifiers can come from Strength and, in extreme cases, Body. A punch does a mere 1d6/2 damage (a switchblade the same! ), a *cough* sword does 2d6+2. Several pages, not surprisingly, are dedicated to healing and drugs. When wounds are taken their value is checked off in four-point blocks with gradual effects, Light, Serious (Stun -1), Critical (Stun -2), Mortal, Mortal 1, Mortal 2, Mortal 3 etc. All characters thus have the same number of hit points, but remember that having a high Body reduces the damage received. At the Mortal level a check has to be taken each turn, with a failed roll meaning death. Stabilisation by medics, a target number based on the damage received, is the only prevention. Even if a character is stabilised they will continue to take damage if they do not receive further medical attention. First aid heals one point every two days, use of medical tech 1 point per day, adding nanotech healing devices heals and additional point per day. Body banks provide spare parts and with the option of vat-grown tissue banks. Body sculpting, including exotic fashion, is available. Most of the drugs described have no beneficial properties in a system sense. Several pages are spent introducing this chapter describing an icon-driven cyberspace which supposedly improves the reaction speed of humans plugged into this world. Netrunners engage in the virtual world with interface plugs or 'trodes and cyberdecks, whose key characteristics are memory (default 10 units), speed (default 0), data walls (default 2) and the programs they carry. Programs themselves are rated by their strength, cost and memory units used, which on a typical deck means that the netrunner is limited to 3-5 programs. Programs are also experienced by the netrunner in a science-fantasy worldview. The general layout of the Net on the international scale is reasonable enough; long-distance links connect major cities, each with their own security rating an trace value. But when the game reaches the mainstay of the hacking enterprise; entry into other systems, or "datagrids" in the parlance of the game, things go quite comically. Laid out on a literal grid, designed to work with crossword puzzles, each CPU is marked with four adjacent memories, and adjacent to these are various input/output devices (terminals are amazingly expensive! ), file systems, security programs etc. Although these are associated with a particular memory unit, they are located elsewhere on the system "subgrid". Worse still, each system is enclosed by "data walls" which can be literally bashed down by an electronic assault, or entered through a "code gate". In other words, the Net is the dungeon crawl of Cyberpunk. The game system for netrunning has some quirky moments as well. Combat rounds are conducted second-by-second in the net, as opposed to the normal three second rounds in the physical world. This can be problematic in actual play as the one netrunner can dominate a session when their actions occur in parallel with those who are in meatspace. Initiative in the net is a determined by the computer's INT + 1d10 versus the 'runners Ref + Deck Speed + 1d10. Computer INT is 3 times the number of CPUs they have, attacks can be carried out under "line of sight" (other "objects" in the way) and "range" (twenty grid units). Stealth and evasion, attacks against systems and decks, are carried out on the attacking program's STR + 1d10 versus the defending program's STR + 1d10. You may note that randomness in the Net is a lot more pronounced, more in line with other RPGs. This reverses however back to the usual scale when anti-personal attacks where the random element is reduced to a lower value than normal with three contributing values plus a 1d10 in a contested roll. A section writing one's own programs begins with adding difficulty costs, starting from the function (Evasion, Decryption, Detection etc), plus Options (Speed, Recognition, Icon), and Strength. Adding a Demon (apparently a compiler) reduces the Memory Units that the program needs, and a cost of linked strength and speed. The total difficulty costs represents a target number for one or more programmers to reach and the time required to complete the program. Finally, virtual realities are described with a description of their size in memory units; 1 memory unit for a conference room with 100 objects, 16 for a virtual city with 1,000,000 objects, multipliers for realism, addition unit costs for crowds and individuals and so forth. The final block includes history, technology, night city, megacorps and various forms ("screamsheets"). The history, starting at 1990, is charming in how inaccurate it has been to date, but more amusingly degree of histronics it assumes. The United States invades Latin America, South Africa has a massive bloodbath, arcologies are built, biological chips are built, nuclear war breaks out in the Middle-East reducing the region to slag (but of course, Israel survives), the United States suspends its constitution and goes under martial law, tens of thousands are killed in a Los Angeles earthquake, a moon colony is established... and all this between 1990 and 2000! A Uniform Justice Code has been established in the U.S. when provides the legal basis for the default setting. Vehicles run primarily on liquefied methane (must smell nice) and alcohols. The communications system includes mail (twice a day! ), streetside data terminals (Internet kiosks, I suppose), cell 'phones and 'screemsheets' - fax-based newspapers. A GMs advice chapter gives the sensible advice to immerse oneself in the genre, and immerse the game in the environment as well. 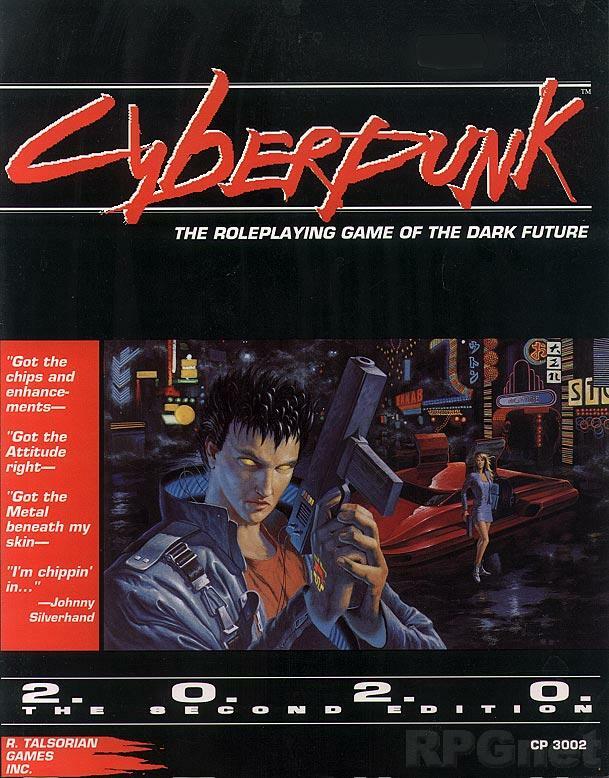 Indeed, the game positively encouraged the players to become cyberpunks, at least for the duration of the session, which is what good roleplaying should be. Apart from this however there isn't much else to go on. A sample scenario, Never Fade Away, is written as a short-story with statistical information for running the game in the sidebars. The scenario itself is fairly good, involving a kidnapped beau, who is an expert programmer, of a charismatic rockstar. The writing however is quite awful. The final chapters are setting-based. The Megacorps 2020 is several pages of general description and then several more of particular company profiles, which oddly does not include discussion of their financial resources, but plenty of the overt and convert military resources. A sample generic location, Nigh City, is useful for quick play, has very violent encounter tables, but is seriously lacking in soul, despite some interesting personalities. Finally the game comes with a selection of 'screemsheets', sample newspaper articles. These are somewhat entertaining, but best of all are used to source no less than ten short scenarios, an excellent contribution. Cyberpunk 20.20 was a very popular game, capturing the zeitgeist of the period very effectively from the 1st edition and establishing itself completely with the second. The style is histronic and somewhat immature at times, but nevertheless managed to carry itself with a great deal of sheer bravado. The game system is fairly simple in principle but suffers numerous rough edges and some downright flaws. The massive netrunning chapter is a disaster, and in actual play, rewriting most of the rules, general design, and presentation proved necessary. The setting history is likewise flawed, although there are a couple of nice touches in the GMs section, and a very handy collection of scenarios.